Joan Didion is my spirit animal. I’ve said it before, but I’ll say it again: she is an incredible writer. One of my favorite lines of all time, from any book, is the first line of The White Album: “We tell ourselves stories in order to live.” I absolutely adored Slouching Towards Bethlehem, and I truly think it captures something intangible but essential about what it means to be in one’s twenties, and what it means to be a Californian. Many of the essays in this collection are short–a few pages long–but incredibly insightful, in a way that makes them stick with you for far longer than it takes to read them. “On Self-Respect” is one of those for me, about what it means to truly respect oneself and the dangers of lacking it. Didion uses Death Valley as a way to look at morality in “On Morality” in a way that is surprising and yet makes perfect sense. 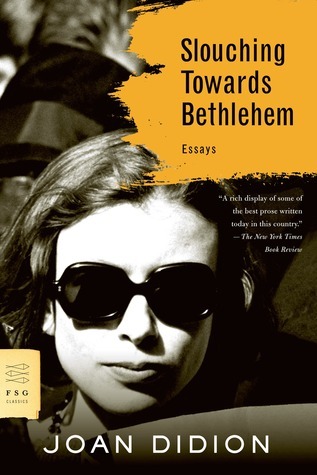 Didion’s more journalistic essays are fascinating, and she has a keen eye for telling stories with a dash of irony and insight that makes them a pleasure to read. The title essay is a slightly dated but still interesting look at the Haight-Ashbury district of San Francisco in the heyday of the Sixties; even better, however, was “Some Dreamers of the Golden Dream,” an essay that looks at the alien-ness of the San Bernardino Valley through the lens of suburban boredom, death, and a murder trial. Where I think Didion’s writing is perfection, however, is in her more personal essays. There are several in this collection, including an essay about growing up in Sacramento, that really stood out, but the final essay–“Goodbye to All That”– really hit home for me. It’s an essay about being a transplant from the West and living in New York City in one’s twenties, about the dreaminess and abstraction of a life in New York and the confusion and simultaneous sense of wonder it instills. As a recent NY transplant from California, I felt like Didion was peering into my own mind with every word, and I know that it is but one of the essays that I will come back to again and again. There’s a reason Joan Didion’s writing is beloved by many, and why she is considered one of our best writers and essayists. The reason can be found in this book. This entry was posted in Book Challenges, Book Reviews, Jessica and tagged Books, books books books, essays, favorite books, Joan Didion, TBR Pile Challenge. Bookmark the permalink.